The post is also available in Italian here. In the last few days a number of, more or less enjoyable, articles introducing the latest book by Jeremy Rifkin, released earlier in March, saw the light on all the most important online newspapers worldwide. In his latest book called “The Zero Marginal Cost Society” the well-known American author recounts his vision: the eclipse of capitalism is coming soon and will be in favor of a completely new model that he dubs “the Collaborative Commons”. In one passage at the opening of the editorial oped that Rifkin published recently on several online outlets he says that “the capitalist era is passing” in a way that inevitable, and that the “new economic paradigm, the Collaborative Commons, is starting to “transform the way we live”. In a few clear and effective sentences, Rifkin frames the history of almost forty years of evolution around the commons. An evolution that brought us things such as Free Software, peer to peer systems, hacktivism and open source; he ultimately speaks of the digital revolution born inside the internet (and for which the internet is a fundamental part) which has later developed inside society in an endless series of real life experiments. A universe that puts its foundations in collaboration, free access and in horizontality: a universe that many, including myself, study and talk about since years. From a purely technological viewpoint, Rifkin’s assumption is this: the unbridled race towards zero marginal cost production, which is typical of the digital world, is permeating all areas of production. On top of the advancements of robotics and artificial intelligence, and of our ability to organize and optimize processes we now have, according to Rifkin, an increasing promising revolution, that of the Internet of things which offers new possibilities for monitoring and automation. Big Data – and artificial intelligence that we can apply to them – will help us to further improve and make processes more efficient and delete the unnecessary. Despite being very convincing and actually in line with what we are seeing (and even broadly agreeing with both Rifkin and Andressen who argues that “the software is eating the world”) this view has, however, few outstanding issues, especially when it goes beyond the digital production and we think to the economy of tangible goods. From one point of view it must be said, however, that even in this field, that of material production, things are indeed changing rapidly. What Rifkin identifies with the term Collaborative Commons would probably be better identified, and the most knowledgeable perhaps already do that, with the far more clear concept of “Commons-Based Peer Production”: the model of participatory and collaborative production based on common goods – such as open source software tools or network – that was first outlined by Yochai Benkler and then explained by Michel Bauwens and many others already mentioned in this blog. In this sense, just a few weeks ago, Michel Bauwens released a first draft of book called “Networked Society and Future Scenarios for Collaborative Economy” which provides an overview of this transition: a very interesting and explaining read that you can find here: http://blog.p2pfoundation.net/network-society-and-future-scenarios-for-a-collaborative-economy-2/2014/04/06. There are two macro models of production: one is the so-called “Cognitive Capitalism” and the other the “Peer Production”. 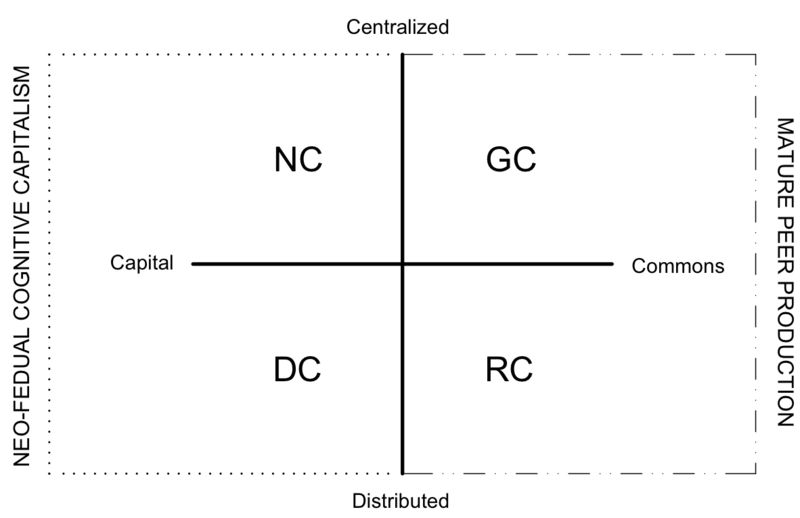 The table is then divided on a horizontal basis following the proximity the commons, while vertical axis is dedicated to address the degree of decentralization. Bauwens outlines four broad scenarios: in the first two we found what he calls Netarchical Capitalism (the model ofFacebook, Google and other social/digital enterprises) and Distributed Capitalism which Michel identifies with things such as Bitcoin and Kickstarter. In Cognitive Capitalism the network is the enabler technology that provides new tools to a capitalist model that – even on top of a cognitive advantage – keeps having strong shades of libertarianism and Anarcho-Capitalism. In these two scenarios, even if the value is produced based on the collaboration users the benefits of production and profits are anyway the benefit of a few (mostly venture capitalists). For clarity, let’s think to Facebook: it could not exist without all of the content that we (user) produce but at the same time the huge profits it generates are only for the benefit of the shareholders of the company. Bitcoin on the other hand is taken as an example as, according Bauwens, peers – in Bitcoin Peer to Peer structure – are computers and not people and the whole system is based on a rather techno-centric approach. 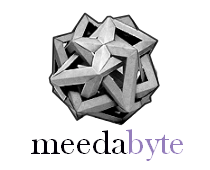 This design approach ended up generating a system that – even if theoretically open and distributed – is now highly centralized, even more than the traditional monetary system, with very few bitcoin-capitalists who hold immense fortunes. So, just in parallel to the changes that we see happening in the global world of traditional capitalism and large organizations there’s an evident new economy emerging. This economy is less energy intensive, is more sustainable and has strongly positive social impacts in terms of diminishing risks and offering new opportunities to communities: as Rifkin correctly says, this economy can operate in conjunction with capitalism in some cases (for example when corporate use and sustain development on Free and open source software) or can deliberately shrink existing market subtracting it from market logics (such as what happens with Community Supported Agriculture or Open Source Designs for a 3D printer you can build yourself). If the traditional vehicle of the biz world remains the Firm in the open ecosystems enabled by the internet and collaboration the stars are communities and co-operation in all its forms. Cooperatives models are revolutionizing and opening production from the bottom up: manufacturing is changingthanks to constantly evolving 3D printing and digital fabrication innovations. A growing network of Fablabs and Makerspaces it growing at an exponential rate that follows the progress of Moore’s Law, doubling every 18 months. After just a couple of years from the initial hypotheses and ideas to build a Fablab in Rome, we finally have few running in a network of labs. Opensource is increasingly being used as an disruptive approach to change markets or industry logics and is finally coming into markets such as automotive (with Open Source Vehicle) or even constructions(with the amazing advances that are Wikihouse and other projects – such as OSE Microhouse are creating). An experimental community on the theme of agriculture and permaculture, is growing thanks to projects such as the Valdaura Self Sufficient Lab Barcelona, ​​the work of Open Source Ecology and others on the agricultural production machines (such as tractors). Much more is going on, in parallel with a lively revival of interest in rurality and decentralization. Experiences of co-living are popping throughout Europe and the world. But beyond rurality and communities, Cities are transforming as well. In July, Barcelona will host the tenth Fablab world conference, the FAB10, with the subtitle “from Fablabs to Fab Cities” speaks loud about the central theme of the discussion. A few days ago, in an interview I did to Tomas Diez (Manager of Fablab Barcelona and projects such as Smart Citizen, further than FAB10) he argued that “The FAB City will turn Barcelona in a productive city in few years, bringing back productivity inside the city, to the citizens, to promote local innovation connected to a global network, to re-industrialize the city, and to produce value on top of that, which will affect every single aspect of the life of people”. In parallel to this, a fervent debate embodies in conferences, blogs, and social media feeding a level of conversation and discussion that never has been possible before. We used many terms to describe this universe, the most of us now identify it with the term “collaborative economy”: the point is we’re finally learning to understand, classify, and use these new – open and collaborative – models, in many new fields. An entire conference – the upcoming OuiShareFest 2014, for which I’m looking after program design – will be dedicated to all this: to understand what, according an authoritative observer of reality such as Jeremy Rifkin, is intended to “transform the economy” through collaboration, low energy and impact. Against the background of this high level of social experimentation and innovation, eventually a rather radical discussion about the central theme of global warming is growing these days and targeting the issue of a rising worldwide complexity and risk factors globally. 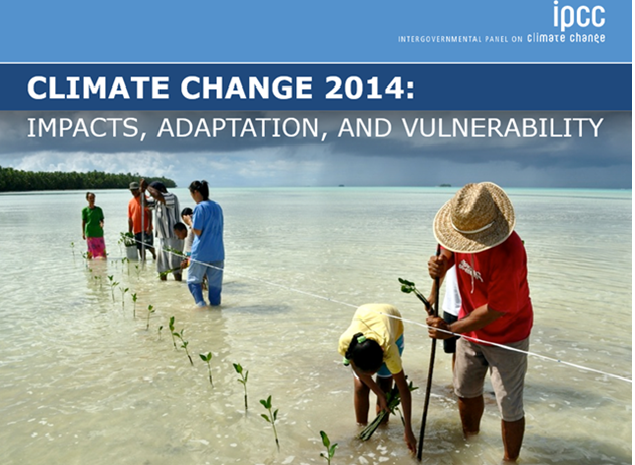 Only a few days ago, a report by the IPCC on climate change has been met with a lot of discussion and concerns. The report looks at climate change as a fact and as a serious risk factor for humanity and warns for only 16 years to implement a solution before the point of no return. The IPCC report also looks for the first time to the issue of global warming as seen in a more general framework for addressing the issue of resilience – that is our ability to withstand shocks. Effectively as The Economist commented: “The new report sees climate as an problem among many, the severity of which is often determined by its interaction with the those other problems” and states that “the right policies frequently try to lessen the burden – to adapt to change, rather than attending to stop it”. This IPCC report marks the end of climate sensationalism and hopefully the beginning of a realist approach to overall global resilience and the prevention of risks related to key resources and (and common goods) such as the quality of air, water or biodiversity. How current this scenario is – the scenario where companies are interconnected with society and its problems, at a time when such a transition is required – it has become even clearer this March 31. Following the release of the IPCC report, Exxon Mobil received a formal request from its shareholders to understand how the company intends to deal with potential risks for shareholders due to potentially upcoming future restrictions on fossil fuels use. In response, Exxon issued a report which basically dubbed restrictions as “highly improbable” and pointed out the impacts in terms of economic development that these regulations could result in countries where applied. So the company argued that would continue to act openly in a “business as usual” fashion as if nothing had happened, generating a wave of reaction and avoiding giving clarifications to the doubts of its shareholders. If we consider the size of the global challenges that are facing us today, it is natural to think that we cannot allow big companies not to be involved in designing the new global economic outlook: at least due to the enormous power that they have on human life and the economy at present. 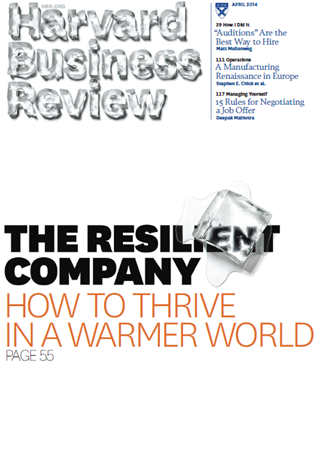 In a beautiful piece on the Harward Business Review (“Resilience in a hotter world” http://hbr.org/2014/04/resilience-in-a-hotter-world/ar/1) which is also the cover of this month) Andrew Winston did a great job in describing the complex problem of brand resilience and explained how, in this historic moment, the answers to the question “how to prosper in the future?” must deal with ecological balance and sustainability. Winston indicates that the solution could lie in a greater permeability between companies and society, with the first that is able to communicate with users and define new behaviors and new narratives. Winston points out two fundamental changes: on the one hand, companies will have to bring down their energy needs and improve the management of waste and negative externalities by implementing the principles of “Cradle to Cradle” closed-loop production that does not produce waste. Secondly Winston focuses on the stabilization of revenues in the long run: a result that can only come from a greater understanding of user requirements and the ability to continuously adapt to them. An image emerges of a company that is in full equilibrium with the environment and society: the limits of this company are difficult to trace. This company is “pragmatically sustainable” on both layers: social and environmental, in a context where more and more opportunities of subsidiary and collaboration with the (partner) state and society show up on the horizon. An interesting case to mention could be that of AirBnb. The company has recently been under a lot of pressure in the United States due to the effects of “gentrification” that led in some cities. The gentrification is a positive process in itself: it regards an improvement in suburbs housing quality but it generates (as a result of the growth in house prices that induces) a tendency to generate the so-called “eviction” phenomena meaning that the original inhabitants of a gentrified area are pushed to move away due to increasing life cost. The implementation of social policies related to housing is always a very complex topic and typically requires substantial funds. In this sense some recent agreements that AirBnb has put in place with the city of Portland and New York are relevant. These Agreements state that the company becomes a state substitute in tax collection and will retain taxes on its turnover producing de facto resources nearly 21 million dollars of new resources in New York, money that is enough to fund, for example, Bill DeBlasio’s social hospitality plans for the homeless. In a program of wider cooperation, a few weeks ago AirBnb signed an agreement with Portland’s mayor Hales called Shared City Portland. AirBnb will collect taxes as it does in NY, but it will go much further. There the will to facilitate host’s donations to local causes, collaboration in the field of disaster relief and even an arrangement in which AirBnb engages in a very tight control of the Platform’s abuses that may have an impact with the housing policies of the city. AirBnb will also promote Portland to its users from a touristic point of view (which, in a sense, is something we are doing today with this article). This level of co-operation on social policies between corporations and governments has been rarely seen: it has happened in other contexts, sometimes in that of cooperatives in some countries – mostly in Europe (Italy it is a case in point) – but in the context of corporates has always been quite rare. I believe that these events are seminal and are alerts of a change. What drivers in the future-proof company? It’s some time now, therefore, that I wonder what it means to create a futureproof business, and recently I have often wondered if this is still a topic of interest. One thing that I pondered often lately is the trends related to S&P500 dynamism. If you look at the history of this index you find that, while in 1958 a company could expect to stay in the S&P for an average of sixty years, today the average number of years is decreased to 18 (and is decreasing regularly). So: what does it mean to prosper? Is it about having a long life? Is it about adaptability? And what about the brand when products become platforms? What emerges clear and strong is a clear demand to companies: to collaborate more with society, creating adaptive solutions that are enablers of relations, economies, trade and creation of value and wealth. The first principle (Enabling Platform) responds to a paradigm that is finding growing success: that value is user-defined and user-built, in a personalized way. The company needs to create a platform that allows users to create their finished product and, in some cases, a product or service to be offered to another component of the ecosystem that can consume it. The second (Ecological Equilibrium) reflects the need to ensure that company’s processes are sustainable in view of a sharp rise in energy costs and externalities that, beyond Exxon’s considerations, is not just a predictable, but also desirable. The last issue, that of Equitable Profiteering, relates to the ability to build supply chains and distribution patterns of production that are co-operative and where the value and profits generated are shared by many stakeholders and spread over the entire value chain. At this level is becoming increasingly clear, as I said, that transforming products into enabling platform is today’s must: the firm produces bricks that the ecosystem of users use to create new value. The transformation concerns the transition from a linear paradigm: “I produce, you consume” to the multi-sided paradigm meaning which users produce and consume on top of the platform that is responsible for the facilitation of relationships and transactions (in relation to this please look into the platform design toolkit). A very interesting example is that of Google’s Project Ara: the project for a modular and open source hardware Smartphone, which brings many promises to revolutionize the production of consumer electronics from a more sustainable and smarter point of view. These days, Project Ara team released the first Module Developer Kit: a manual that includes all the technical specifications of the platform and the links to files for download. That’s a first step toward a smartphone platform developed in an open and collaborative way (I’ll keep an eye on this project ​​and will keep you informed on this). Beside the generation of substantial data, information and metrics and their interpretation, resilient companies must shifts focus on “awareness“. Although Agile and Lean practices challenge organizations to operate on short batches and apply continuous adaptation and changes; futureproof companies, also adopt longtermstrategic thinking based on situational awareness. Strategic mapping can be a fundamental tool when operating in markets based on exponential change, such as today’s markets. With these (exponential) dynamics playing in the game if you do not understand market changes very early and very clearly, you are likely to experience effects of changes when it is already too late and the disruptionis therefore inevitable. That’s a pretty common pattern with exponential processes: you don’t notice them until they’re too big to be controlled. So, to follow the words of Simon Wardley (whose blog I’ll never praise enough) “Business is a game of chess”, the important thing is to learn how to play: to study the moves of other players, assess their in advance and plan your own. Understand how a given strategic choice, such as releasing a previously proprietary technology in open source, or transforming a product into aservice (as is the case with auto manufacturers now stepping into car sharing) can impact your target market is a matter of value chain analysis and understanding. This is certainly the era of the end of Fordist micromanagement and siloed organizations: you may already know that the largest and most innovative companies in the world today have a manager-employee relationship who is even 1 to 60 (as for Google). The horizon of the experimentation in this field is really very exciting. A few weeks ago there was much talk of Holacracy – in correspondence of Zappos’ announcement about the adoption of the same – but the pioneers of anti-fragility and fluid management are scattered around the world. Just a few days ago, Cocoon Projects – an innovative Italian service firm that adopts the principles of lean, co-creation and openness – was awarded as a winner of MixPrize Digital Freedom Challenge by virtue of its original, stripped down and innovative management process that leads to the “liquefaction of rigid controls and structures that create bottlenecks, silos, hallway, misalignments and the myriad of other organizational pathologies”. Interesting and related news from New Zealand is instead the birth if Loomio an open source platform to foster collaborative decisions making in organizations that is born from the collaboration between activists of the Occupy movement and the network of social enterprise Enspiral. As we can see, models come both from a changing corporate world (such as with Valve or Cocoon Projects) and from the world of the social enterprise, sometimes producing even more ambitious visions like that of Open Value Networks: open networks of value creation that provide all the functions of a “corporation” (such as accounting, asset ownership, etc…) but in an open manner and according to the paradigm of collaboration. Basically, Open Value Networks apply the open source model to the corporate: they embody a protocol that is capable of coordinating open enterprises, around a common production infrastructure and facilitate the reuse of assets produced within the network, taking care of the fair distribution of the profits generated on top of common resources. Can real innovation in management exist if the Firm governance model is old, monolithic and unchanged? And what about the ownership structure of the same? Indeed some of experiences presented here show that it is technically possible to innovate a management model without affecting the private capital structure behind it. For example, Google and Valve are privately held companies with different types of investors with no particular innovative ownership structure (details regarding employee benefits packages mechanisms that may operate are undisclosed). A massive wave of innovation regarding ownership is already in place and is empowering several experiments of cooperative management such as those represented by Las Indias (http://grupolasindias.coop/)- a Spanish transnational cooperative network – or the English United Diversity (http:/ / uniteddiversity.coop/). Another fundamental aspect in the transition towards a low energy, efficiency and agility based company refers to the ability to rely on existing infrastructures and not create new ones. This approach is essential not only from a resilience and efficiency perspective but also to generate a rapid and exponential growth while keeping the “zero marginal cost“. Leaning on the existing makes it possible to grow quickly and to exploit the so-called “idle capacity” made ​​of untapped resources. Once again, the clear example is that of AirBnB, which has created a business that now nearing $10B literally out of nothing (or better from your couches and your vacant room) and is now capable of rivaling the largest hospitality chains in the world in terms of nights. Therefore is increasingly clear that we need a radical rethinking of the mission of capitalism and of the nature of the Firm because as they have a too much important role in shaping our future in this delicate moment. “beside culture and structure, organizations have to rethink about their nature […] For more than a century, they have grown on top of our society, draining tangible and intangible resources for their own sake, up to the point they have become totally closed systems, subject to growing entropy. I was also thinking out loud about the prospect of a postgrowth/degrowth capitalism and what it might entail. The interesting question here is the decision structure of such a social-ecological value creating network as well as its latency i.e. what stabilizes it over the immediate solution delivered (project vs. organization). Am curious how this whole strand of thought will develop in the future – and moreover what the practice of that future will look like!